HelpHound Blog: When are consumers going to rumble reviews sites? Today the spark went out - Spark Energy went bust. Which reviews will you - and your potential customers - be trusting from now on? 'Deflection' is what happens when dissatisfied customers write to Google rather than the business's reviews site of choice - you can see it's happened here. 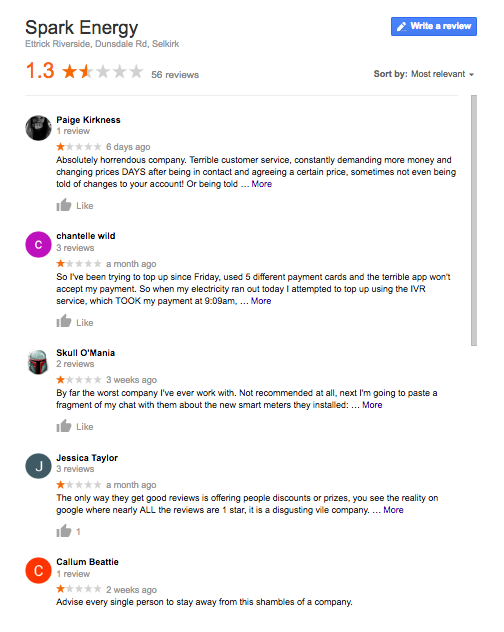 'Fear' - the reason so many businesses opt for a reviews site is a well-founded fear that should they invite their customers to post reviews direct to Google their image there will be dominated by the 'unhappy minority'. That's why review management - HelpHound - exists, to ensure that the absolute minimum of unfounded, unfair, inaccurate and misleading reviews are posted.